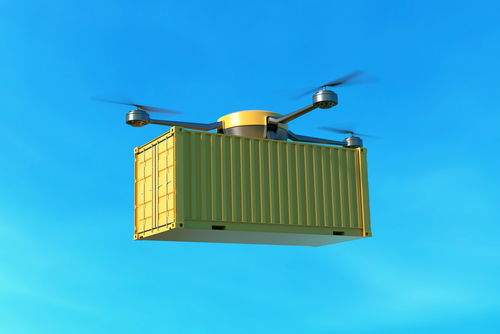 Drones, the new frontier of air freight - Specialty Freight Services Inc. In the science fiction TV show The Expanse,drones constantly buzz around in the background of the New York City sky in the year 2350. In the science fiction movie Ready Player One,drones deliver pizza in Columbus, Ohio in 2044. And while many other sci-fi media creations feature the use of drones, real life drone usage is passing from science fiction into an inevitability. Drones are already utilized by the public for a variety of purposes. Some use drones for simple recreational purposes, just like they might use an RC car. Others use the camera capabilities of drones for media purposes. However, perhaps the most interesting use of drones is that of autonomous delivery. These are the kinds of drones that technically fall under ‘air freight’ despite radically altering the meaning of the term. As with any form of air freight, drones are subject to government regulations and guidelines. However, unlike traditional air freight, these regulations are still being determined. Thankfully for investors and anyone interested in drone freight usage, there has been a shift in regulatory practicesfrom considering drone delivery as a danger that needs to be limited to an inescapable fact of logistics that ought to be regulated as such. In the United States, that is evidenced by the Federal Aviation Administration’s Unmanned Aircraft System Integration Pilot Program. The UAS IPP is “an opportunity for state, local, and tribal governments to partner with private sector entities, such as UAS operators or manufacturers, to accelerate safe UAS integration.” In other words, the program exists explicitly to research and implement reasonable regulations for drone usage, including air freight. Such regulations will be important, as companies will welcome guidelines to shape their explorations into the new technology. However, some large companies are forging ahead with their own research and development anyway. On August 30, 2018, Walmart Inc. filed a patent with the U.S. Patent and Trademark Office titled Systems, Devices, and Methods for In-Field Authenticating of Autonomous Robots. Combining drones with another hot-button buzzword and technology, blockchain, Walmart’s system would enable factory products to be directly delivered to consumers, thereby avoiding time delays associated with product transfers between logistics channels. Air freight is certain to undergo changes as technology also changes and evolves. Will drones eventually deliver pizzas or zip around the skies of our largest cities? That is the biggest technological question currently in air freight.